Localising Leanganook has the pleasure of hosting an inspirational speaker from Queensland, Dr Michelle Maloney, National Convener of the Australian Earth Laws Alliance (AELA). Michelle is co-founder of AELA and one of the driving forces behind this paradigm shifting initiative. Michelle will introduce us to Earth jurisprudence, or ‘Earth laws’, which calls for us to shift the underpinning structures of industrial society to nurture, not destroy, the natural world. Note: this conversation is on Saturday, rather than our usual Sunday afternoon. 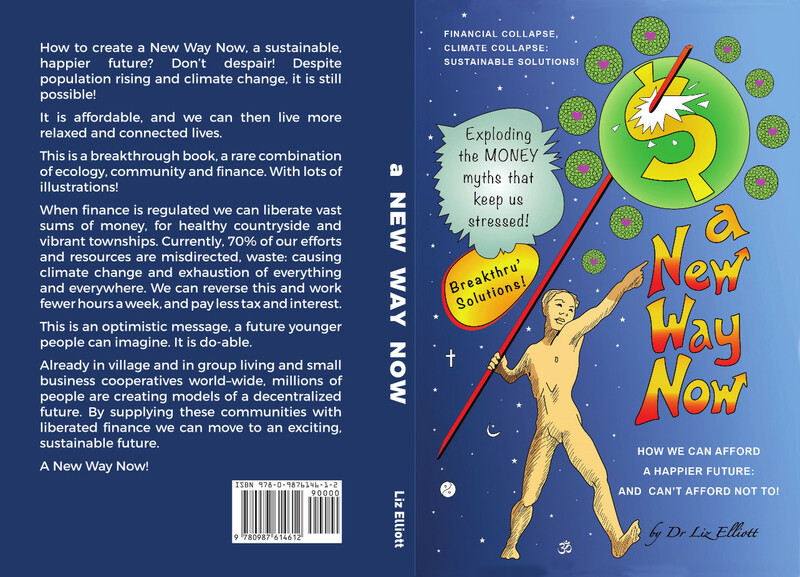 As we face a climate changed world and transition away from our destructive reliance of fossil fuels, human societies have an opportunity to create new ways of working together and nurturing the wider Earth community. Michelle will discuss how Earth laws offer a grounding for new forms of social and ecological governance, economy and community. She will discuss a range of practical projects that enable communities to engage with Earth centred laws, governance and ethics, including: The Green Prints project, the New Economy Network Australia, the Australian Centre for the Rights of Nature, AELA Education, Earth Arts and other projects. There will be an opportunity for questions and discussion after Michelle’s presentation. Dr. Michelle Maloney has a Bachelor of Arts and Law (Hons) from the Australian National University and a PhD in Law from Griffith University. As Co-Founder and National Convener of the Australian Earth Laws Alliance, Michelle manages the strategic direction and governance of AELA, including the extensive partnerships and networks that AELA has with the legal, academic, indigenous and environmental advocacy communities. 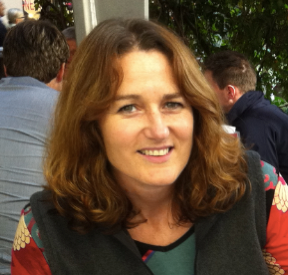 Michelle also designs and manages AELA programs and events, including AELA’s Rights of Nature Tribunals, and coordinates the work of more than 25 multi-disciplinary professional and student volunteers around Australia. Michelle has edited two books and written a dozen or so articles and chapters. For more information about Michelle’s work visit her profile page. What are Earth Laws & Earth Jurisprudence? The Australian Earth Laws Alliance draws its inspiration from an emerging theory of law called Earth Jurisprudence – also known as ‘Earth Laws’ or ‘Wild Law’. Earth jurisprudence is a new legal theory and growing social movement. It proposes that we rethink our legal, political, economic and governance systems so that they support, rather than undermine, the integrity and health of the Earth. Earth Jurisprudence stresses human interconnectedness and dependence with the natural world.Recognition of human interconnectedness with nature is a prerequisite for ecological sustainability and should be recognized as the foundation of our legal system. Historically, the environmental conditions of civilizations have been altered by geographical, cultural and socio-economic changes. However, contemporary industrial civilization has altered its environment to such a degree that its own existence has been placed in jeopardy. The Australian Earth Laws Alliance (AELA) is a national not-for-profit organisation whose mission is to increase the understanding and practical implementation of Earth centred law, governance and ethics (or ‘Earth jurisprudence’) in Australia. AELA works to build long term systemic change, so that human societies can shift from human centred to Earth centred governance. ALEA’s vision is to create human societies that live within their ecological limits, respect the rights of nature and enjoy productive, sustainable economies that nurture the health of the wider Earth community. 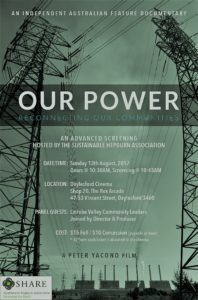 With panel guests- Latrobe Valley Community Leaders joined by Director and Producer. August 27th will include a bicycle puncture repair workshop – please bring a repair kit, and sewing machine maintenance – bring oil if you can. You need to book for this due to space – facebook or ring Chris on 54705508. Puncture repair and knife sharpening from 11.00am. Sewing machine maintenance will be at 11.00am and sewing repairs from 12.15pm to 1.00pm. Darning and electricals as usual. The Repair Cafe is from 10.00am to 1.00pm at the Ray Bradfield Room on the last Sunday of each month. The next D4D event will be Wednesday September 13th. To get an alert when tickets are released, make sure you are signed up to the D4D newsletter. 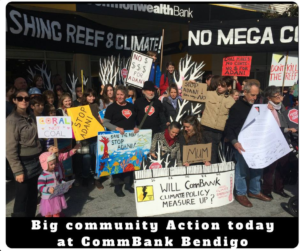 On July 14th, a crowd ranging from young to old, gathered at Bendigo Commbank with tape measures. CommBank does not measure up to what Australians expect from a major bank. We expect banks to be financially and morally responsible and to rule out financing destructive new fossil fuel projects like the Adani Mine that will destroy our chances or restoring a safe climate. So, we’ve got your measurements now, and we know how many people we can cram in your doors at our next protest if your climate policies fail to measure up again in the coming weeks. 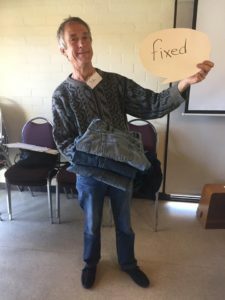 At Localising Leanganook’s July community conversation John Terry, a member of the facilitating team for Castlemaine’s Rites of Passage, spoke about giving boys and men a different experience, an experience of connecting to something bigger. Rites of passage are intrinsic to many cultures around the world. Puberty is traditionally acknowledged as an important transition, one to be acknowledged rather than ignored. For the past seven years young men from around the Castlemaine area have welcomed the opportunity to spend three days and nights in the bush. This opportunity comes at a time in their life when there are changes in relationships, questioning and doubts, and the potential for young men to get into trouble. John spoke of the young men being present and connecting to self, community and nature. The men face challenges to their physical body, to thoughts and to each person’s being. The young men are acknowledged, supported/mentored and celebrated for who they are. Being able to develop and maintain supportive relationships in the local community is a key strength. The program is also evolving women in the process in response to the need from mothers and partners. © 2017 Localising Leanganook | Site by Greengraphics | Beautiful banner photos by Bernard Slattery & Bronwyn Silver, FOBIF.